As in all the other years, I’ve chosen the images (from those I was able to capture at the time, as many are not easily available via archive later) based on their visual aesthetics, meteorological interest, and/or impact of the weather phenomena. Most are on my side of the world from the eastern Pacific across North America and the tropical Atlantic, plus some elsewhere, and even two which are literally out of this world. A couple of the animated GIFs are particularly small in dimension and optimized to meet file size limits for embedding. There are a lot of images included this year, thanks in part to the launch of the GOES-R/GOES-16/GOES-East satellite and no thanks to the extremity of the Atlantic hurricane season. So many, in fact, that rather than intentionally “burying the lede” at the end as in previous years, I’ve put my choices for the top images of the year up top, and for the first time went with a Top 20 (not ranked within that). Then scores of others follow, the stories of the year told through weather geek eyes. And that means marveling at the fascinating science of meteorology and extraordinary power of the atmosphere — while also contemplating what those forces are capable of and how much suffering they have brought. 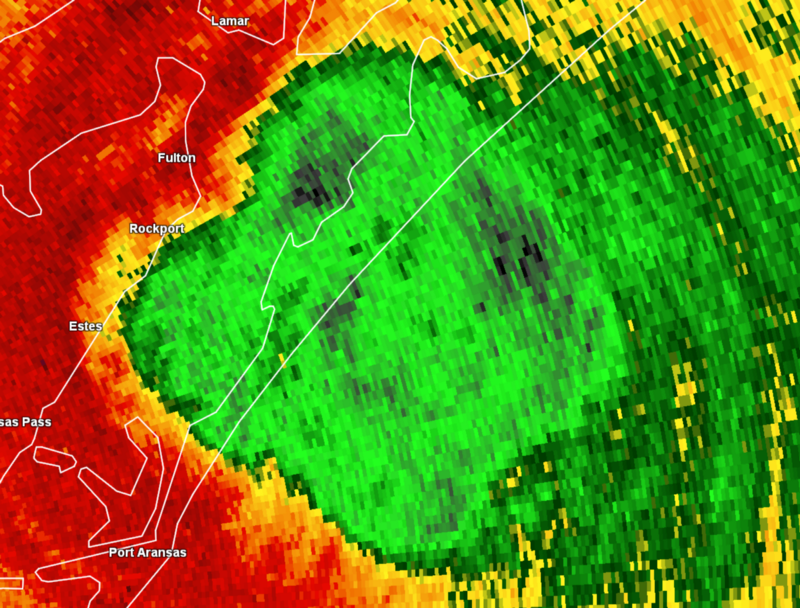 111 hour radar loop from the landfall near Rockport till the rain finally started to diminish in Beaumont – Port Arthur. 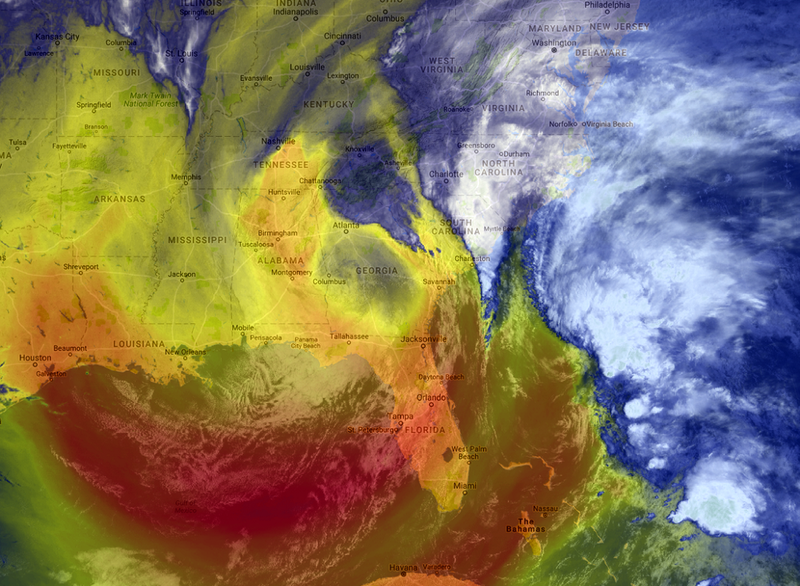 Record tropical cyclone rainfall in the U.S. 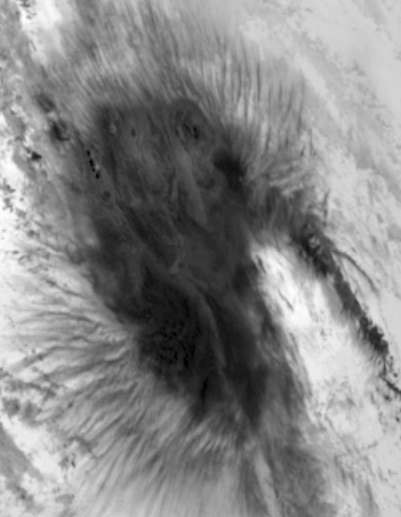 Detail of Irma thermal structures from the European Space Agency Copernicus Sentinel-3 satellite 12um brightness temperature. Irma’s devastating track across the northeast Caribbean islands. 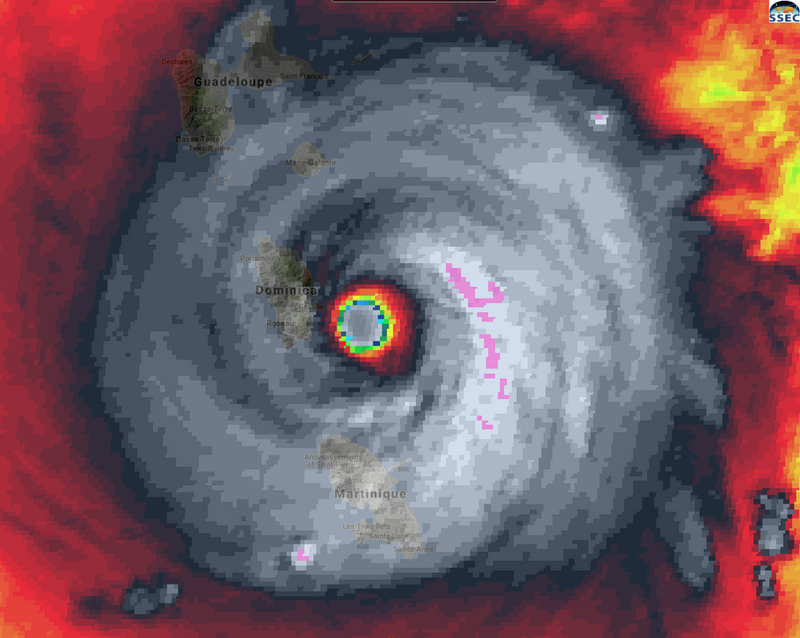 As the eyewall hit Dominica. 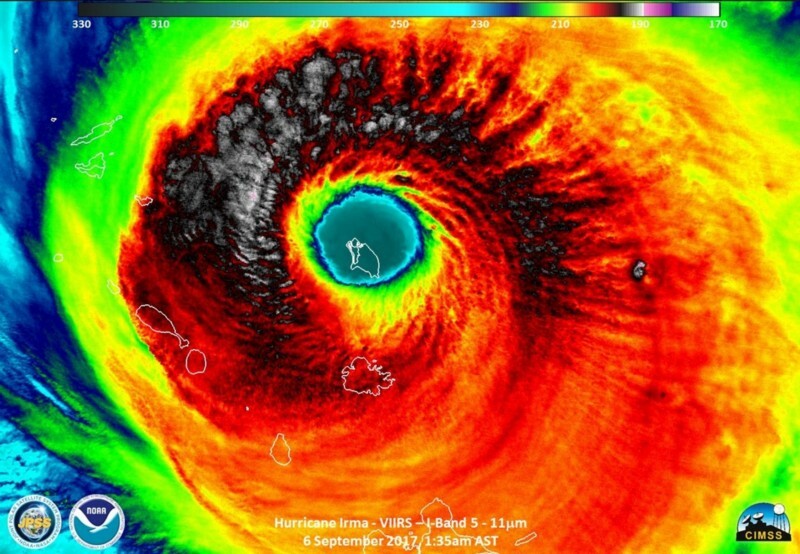 Double donuts of destruction — the inner and outer eyewalls — as Maria approached St. Croix and Puerto Rico. 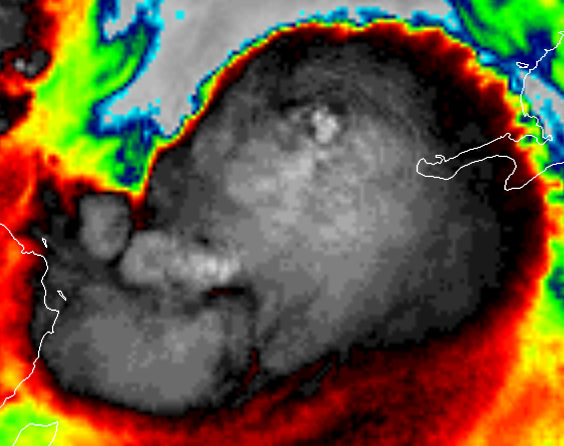 Wild gyration of the inner eyewall, after the outer eyewall interacts with St. Croix (islands highlighted). From south of two non-tropical cyclones, to picking up dust from Africa and smoke from fires in Spain and Portugal, to hitting Ireland and the UK. 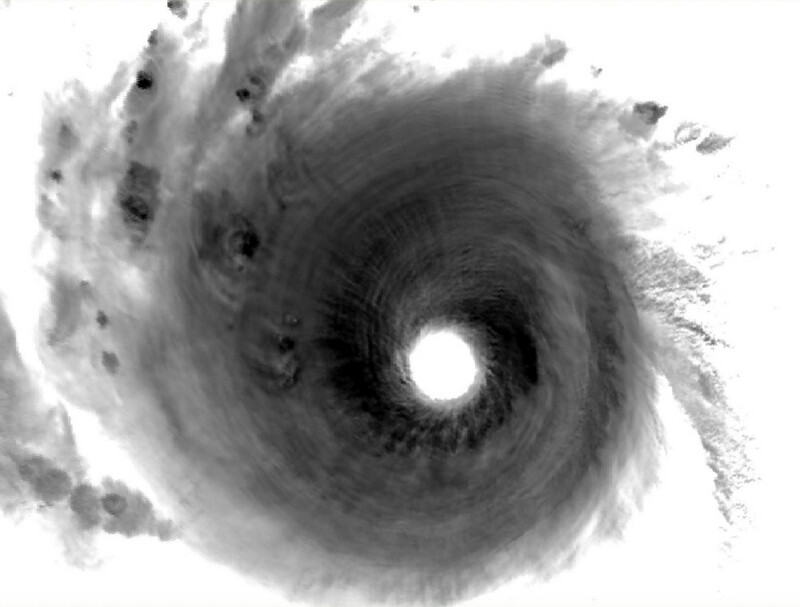 A 3-month high-resolution video of the whole Atlantic basin during the peak of hurricane season from which this was taken is available via https://svs.gsfc.nasa.gov/cgi-bin/details.cgi?aid=12772. 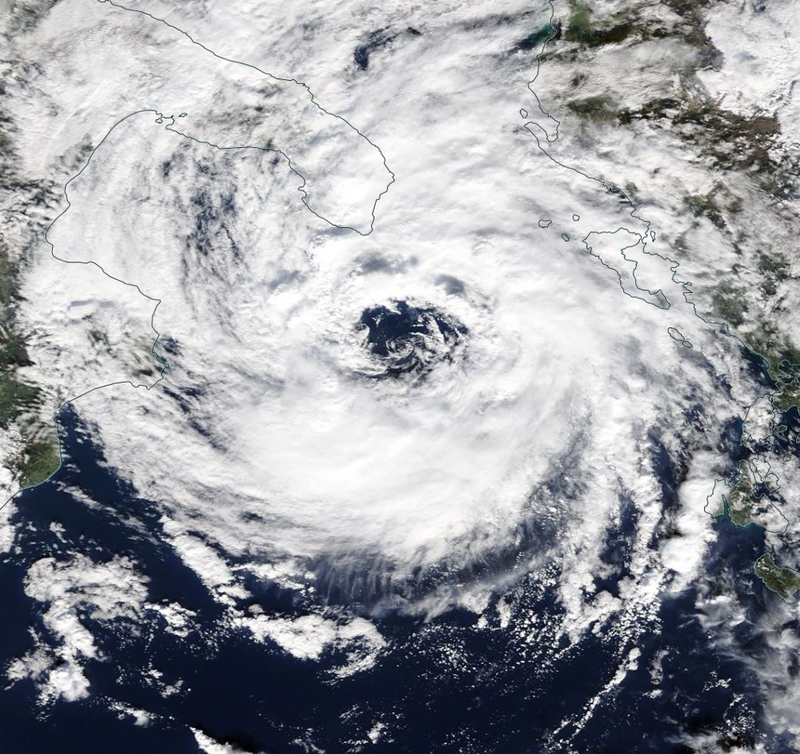 Transformation during three days in November from a cold cutoff low with a sprawling chaotic structure to one typical of a medicane with convection wrapped tightly around the center. Strong (>400 meter departure from average), warm ridge of high pressure aloft, which was a key to everything from an atmospheric river north all the way to Alaska with extreme snowfall rates there, to unusually warm weather for December up to the Arctic in northwest Canada and Alaska, to an exceptionally long-duration Santa Ana fueling the fires, to accumulating snow in south Texas in early December before Boston or Albany. Exceptional for any time, much less so early in the season. 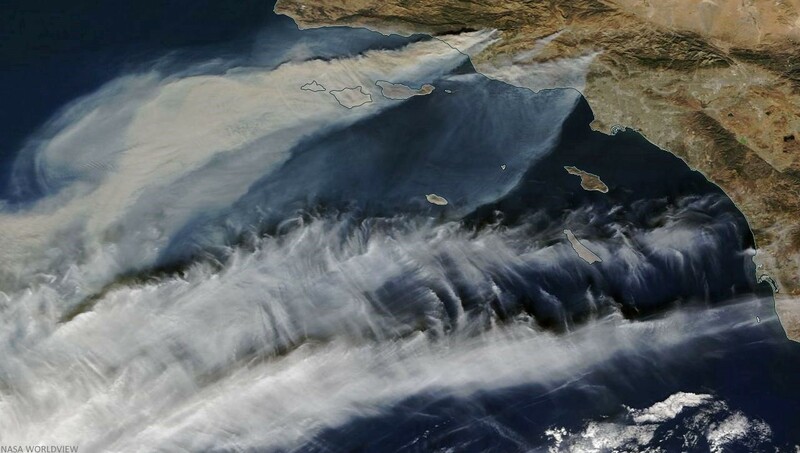 Smoke from the SoCal fires, cirrus with the STJ (subtropical jet). Approximately a month from its summer solstice. And surface cooling, stabilization and suppression of cumulus clouds. GOES-16 (formerly GOES-R and now GOES-East) looks at the sun too. High-resolution video and other simulations available at https://www.youtube.com/watch?v=uLkghfvE0Rk. Eyes, long nose, and hairy body. 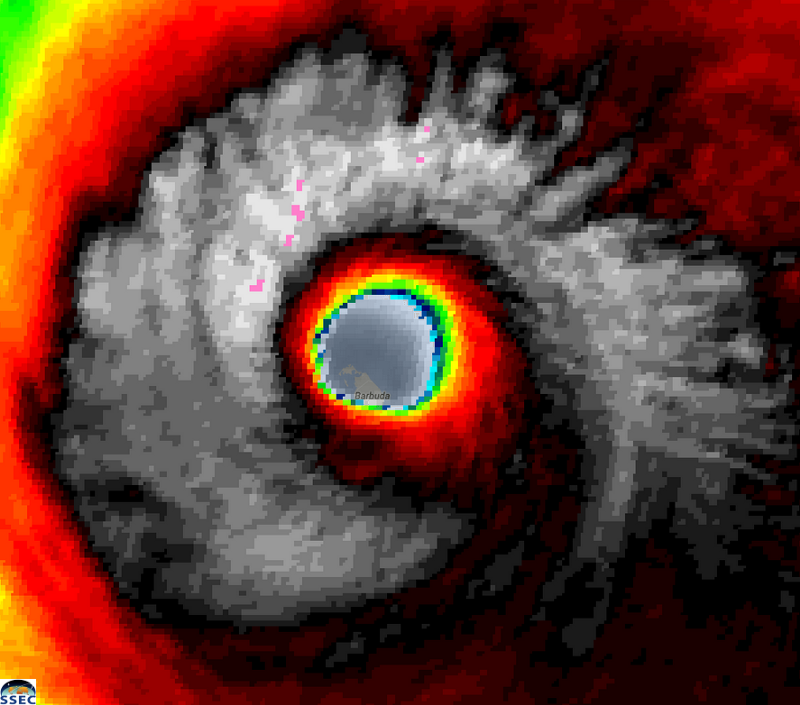 Within the structure of eyewall/eye mesovortices at landfall. Face looking east at the end of this sequence of radar velocities with the blast of damaging wind that came across eastern Massachusetts on Christmas morning as a cyclone rapidly intensified. 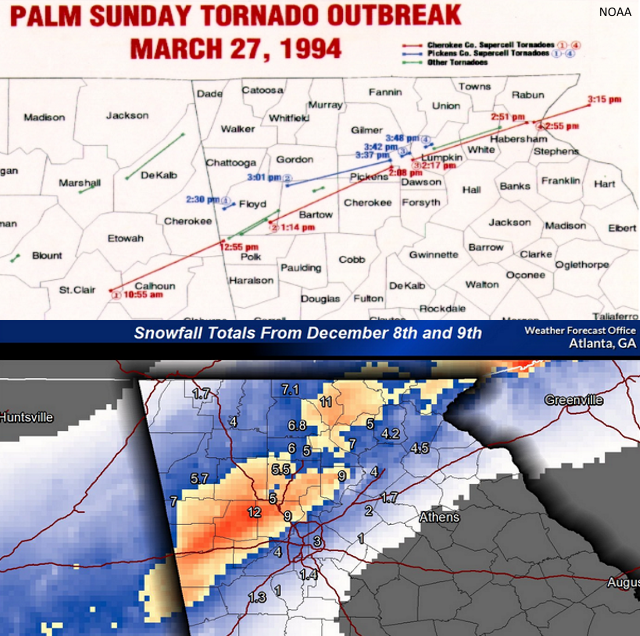 Were a couple of them in January, one early and one later in the month, the latter being one of the biggest winter tornado outbreaks on record. 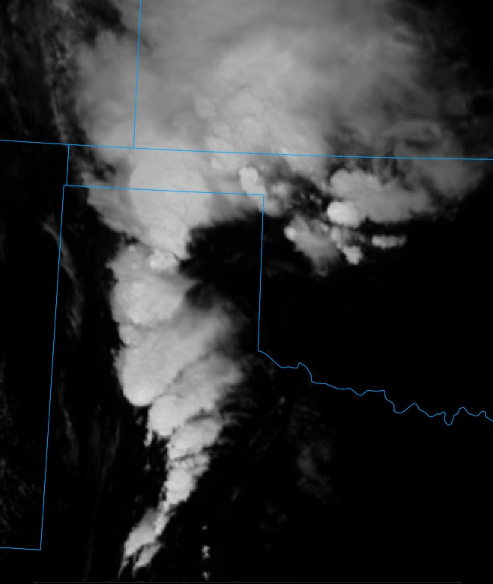 While not producing the strongest or deadliest twisters, there was an unusually large number produced by this line of thunderstorms (as opposed to individual discrete supercells) associated with an MCV (mesoscale convective vortex). Larger one and its smaller sibling. A particularly vivid example of one near the NW edge of a snowstorm. Would you like a cup of coffee with your cinnamon bun? 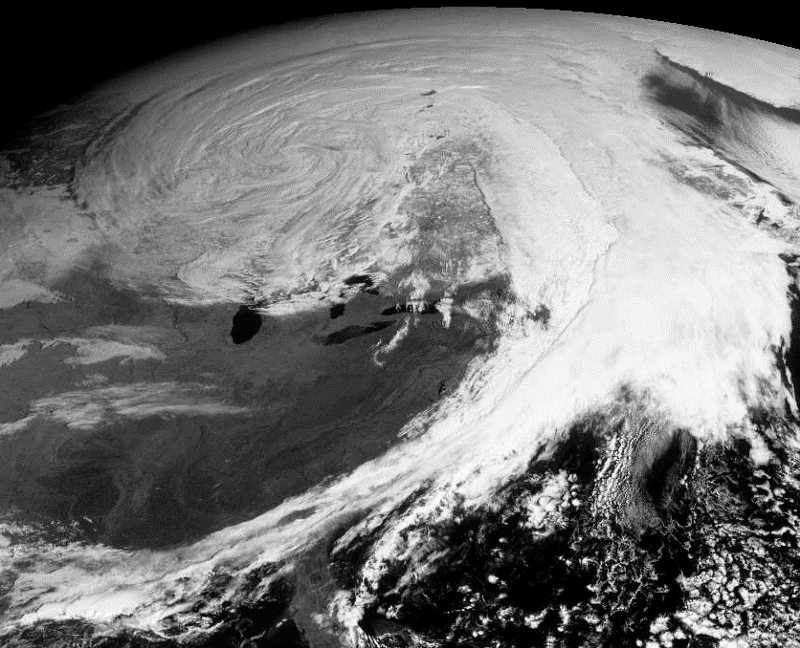 Which produced widespread powerful winds across the Great Lakes region. 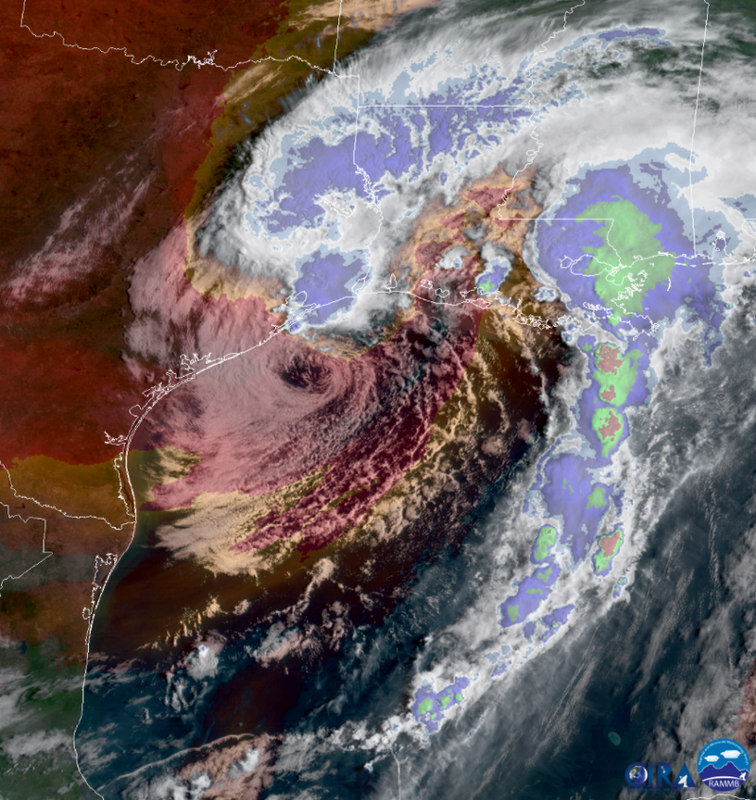 The MCV in the northeast part of the image produced a derecho (convective windstorm); a long outflow boundary was left in its wake back across Georgia into Alabama. 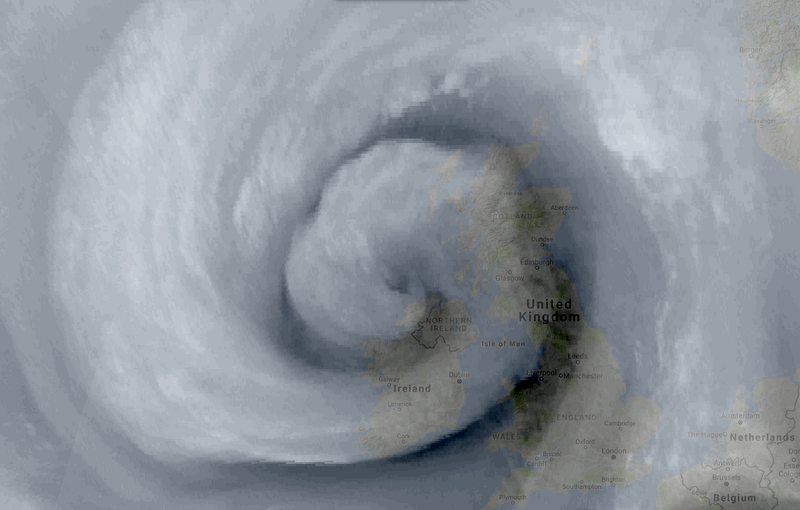 The satellite image of this thunderstorm zone resembled the shape of a tornado. 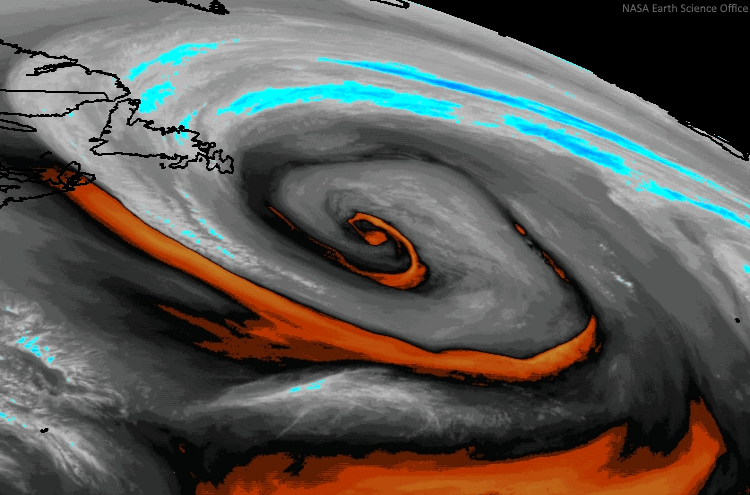 What was that swirling up along the Washington coast?! 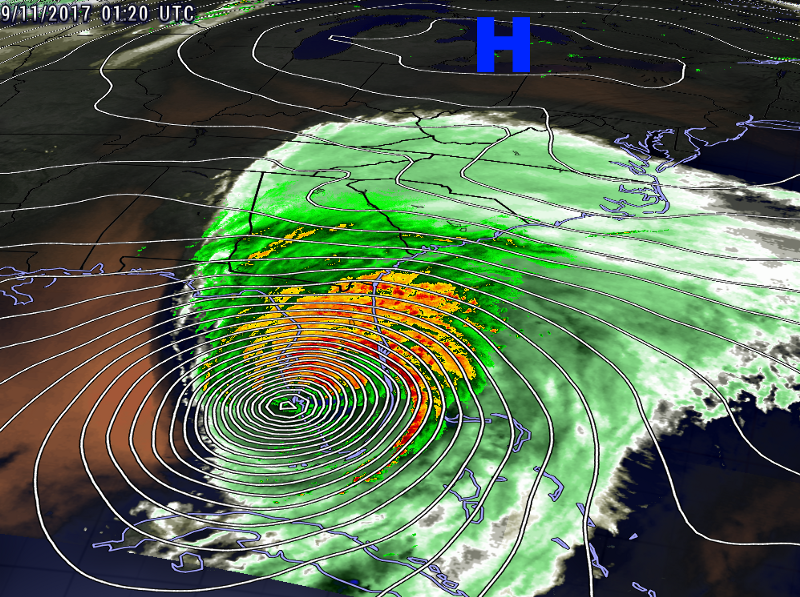 A swirl “making landfall” on the North Carolina coast. It merged with a mid-upper level low and the result was flash flooding in Raleigh, N.C. While anticyclonic circulations (blowing clockwise in the Northern Hemisphere) exist with only a very small percentage of tornadoes, they aren’t rare per se. But ones such as this with a path as long as seven miles are. The development of wet convection along a stalled front. Radar estimated rainfall from the rounds of training torrential thunderstorms which produced disastrous flooding. Another explosion of thunderstorms along a long narrow zone resembling the one above. 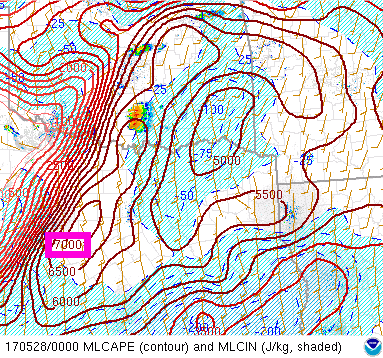 It involved a release of CAPE (convective available potential energy) in excess of 7000 joules per kilogram, an extreme value. 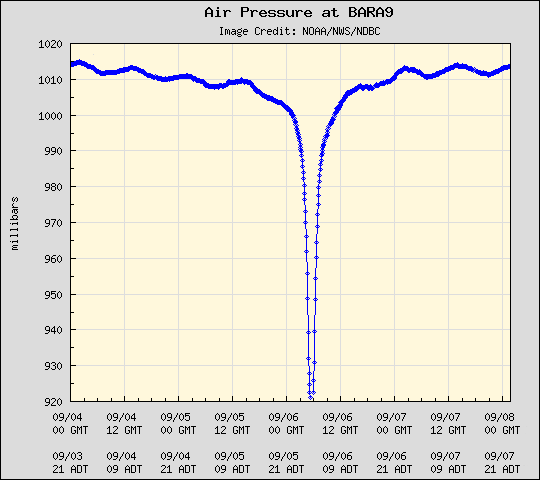 Rather than rainfall being the primary impact, this time it was widespread damaging winds. 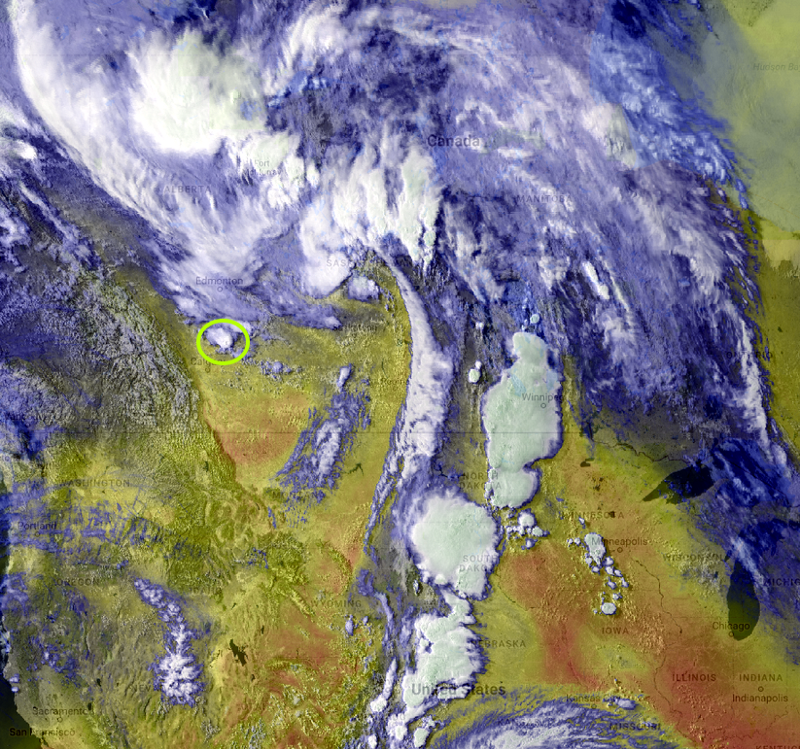 We already had high resolution (both spatial and temporal) loops like this, from the Himawari-8 satellite on the other side of the world, but in spring 2017 thanks to GOES-16 we for the first time had them during the spring convective season in the Great Plains of the United States, including this one of a classic dryline thunderstorm eruption. Estimated to be the most expensive in Colorado history. While the Pacific Northwest does get thunderstorms, it’s not every day that there are a couple dozen reports of severe wind and hail, as was the case this afternoon in early May after morning fog burned off. And off the Cali coast near the Oregon border, I spy a low cloud swirl! The first hurricane seen by GOES-16, in the eastern Pacific. 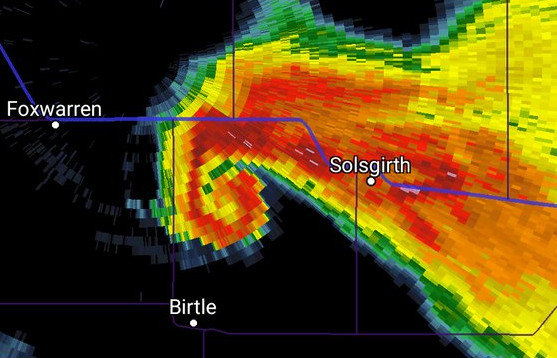 Meteorological context of a spectacularly photogenic tornado. 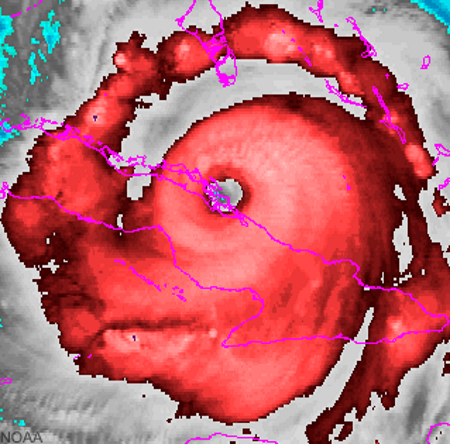 Had its beginnings as a CAG (Central American Gyre), producing deadly floods there, then evolved into a large hybrid over the Gulf of Mexico, was named, and finally tightened up into more of a tropical cyclone structure right before landfall — but with two apparent centers. 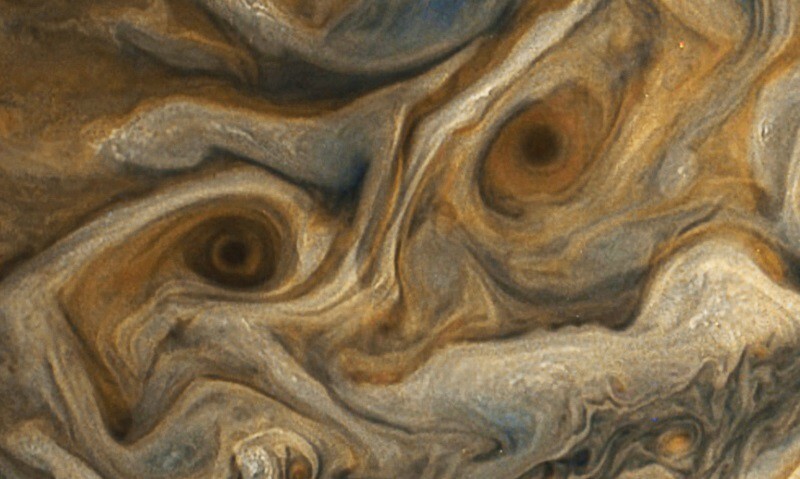 More wavy stuff, this time what appears to be undular bores overlapping and interacting with each other. Stunning structure with this supercell. 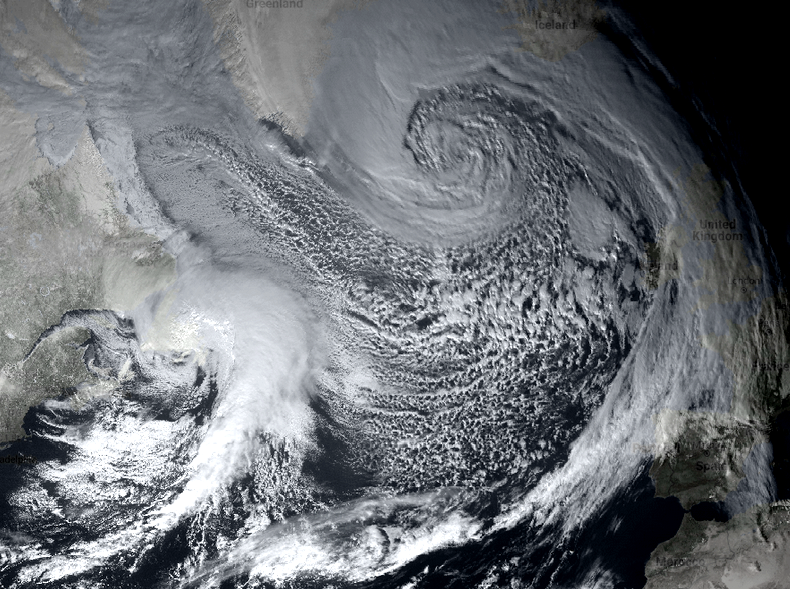 … despite the storm being tangled up with a non-tropical front. 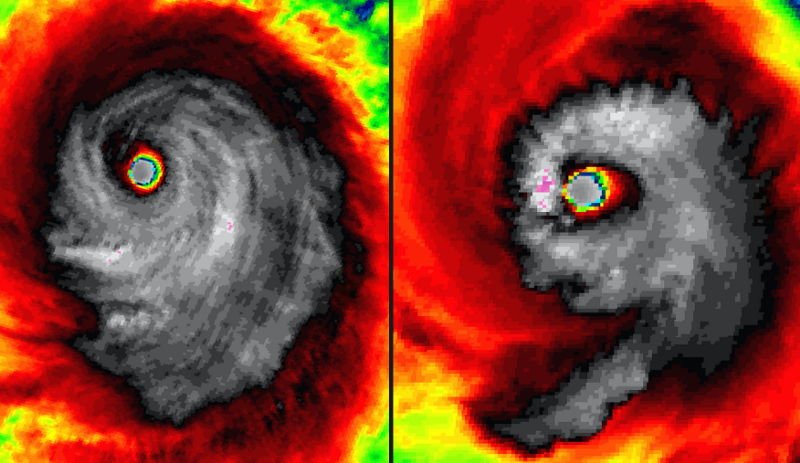 A remnant MCV over the desert of Arizona resembled a weakening eastern Pacific ex-hurricane moving over colder water, and then there was one of those a few days later (Fernanda, on the right). 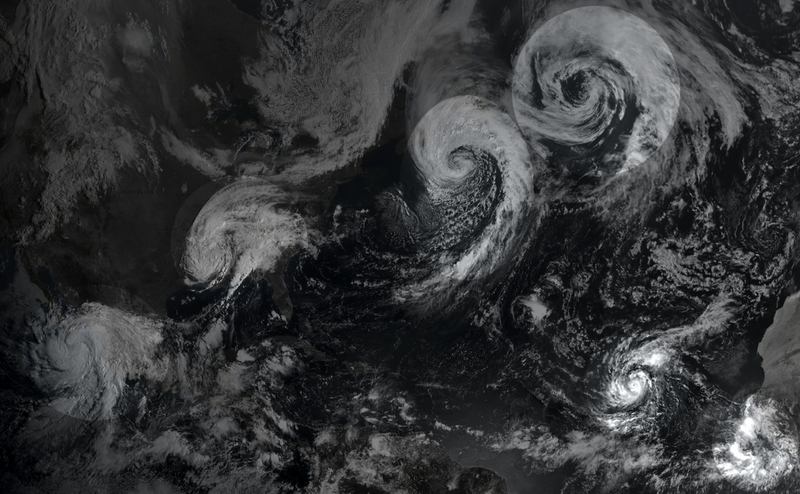 Two tropical cyclones in the western Pacific having a classic Fujiwhara interaction. Tropical Depression Four with dust from Africa to its east. 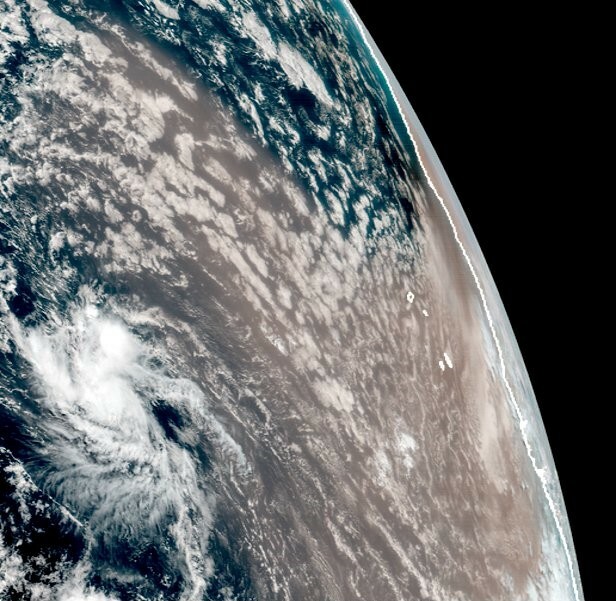 Unfortunately, the dry dusty air and short-lived TD4 were less of a sign of the state of the atmosphere than was Bret in June — and Gert in mid-August, quite strong for so far north. The upper-level “exhaust of the engine,” facilitating continuing health of the storm and, with slow movement, the extreme rainfall that was to follow. 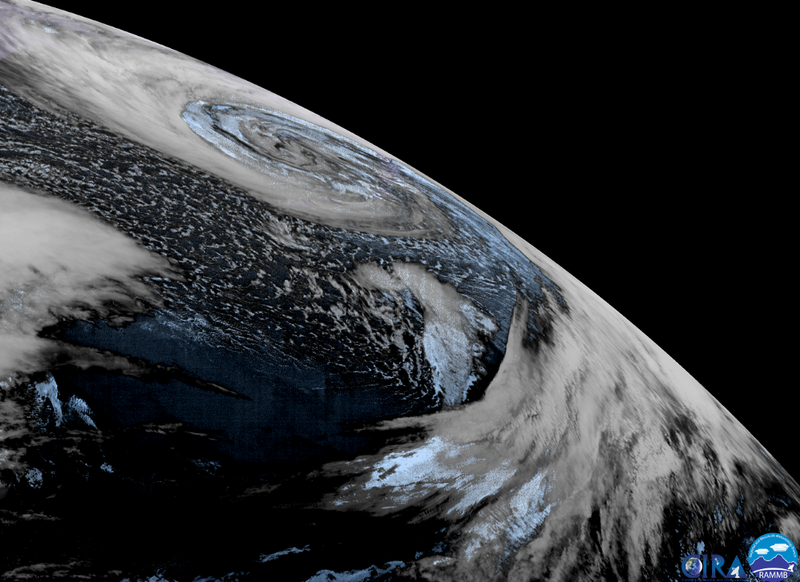 Somewhere on the tropical/subtropical/extratropical continuum; officially classified at the time as a tropical storm. Barbuda in the eye (location slightly different in the images due to apparent satellite navigation differences). 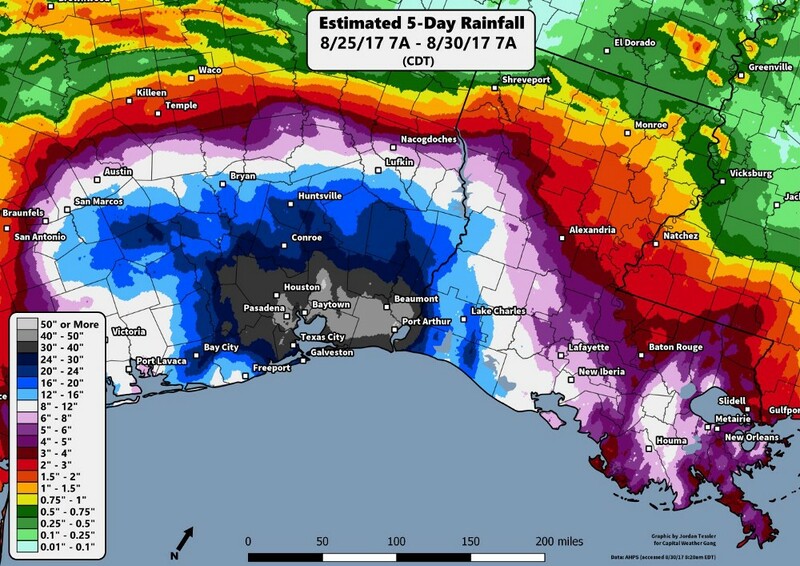 Irma evolved into a large gyre with widespread wind impacts and local severe flooding in Florida, on its way to interacting with mid-latitude influences and downing countless trees in Georgia. 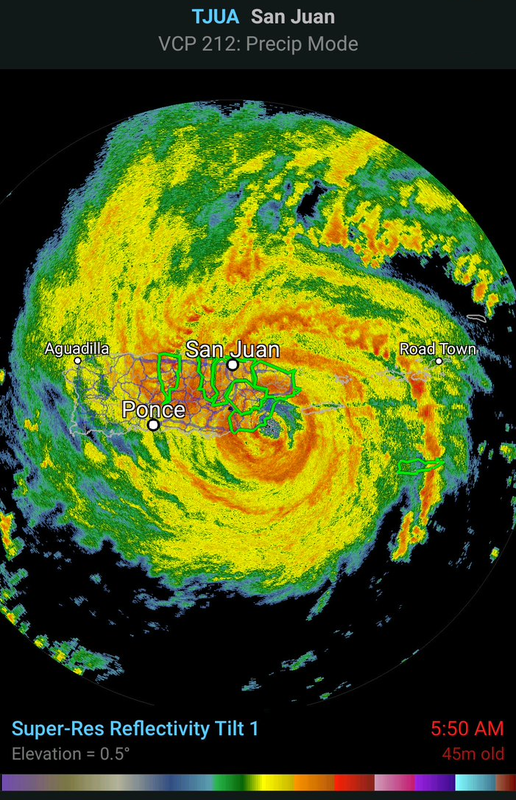 Déjà vu, as Hurricane Jose was in the almost exact same place as Irma was just a few days prior. Fortunately Jose was on a different subsequent track. 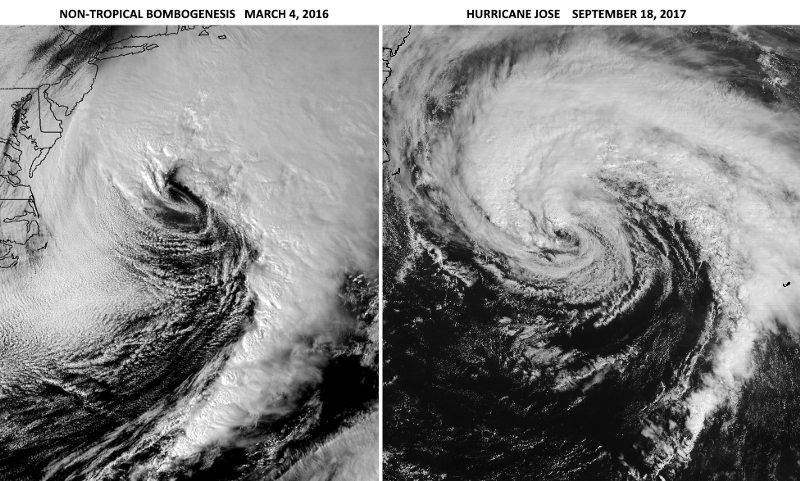 While still classified as a hurricane (tropical), Jose had a similar appearance to that of a meteorological bomb last year in approximately the same location. 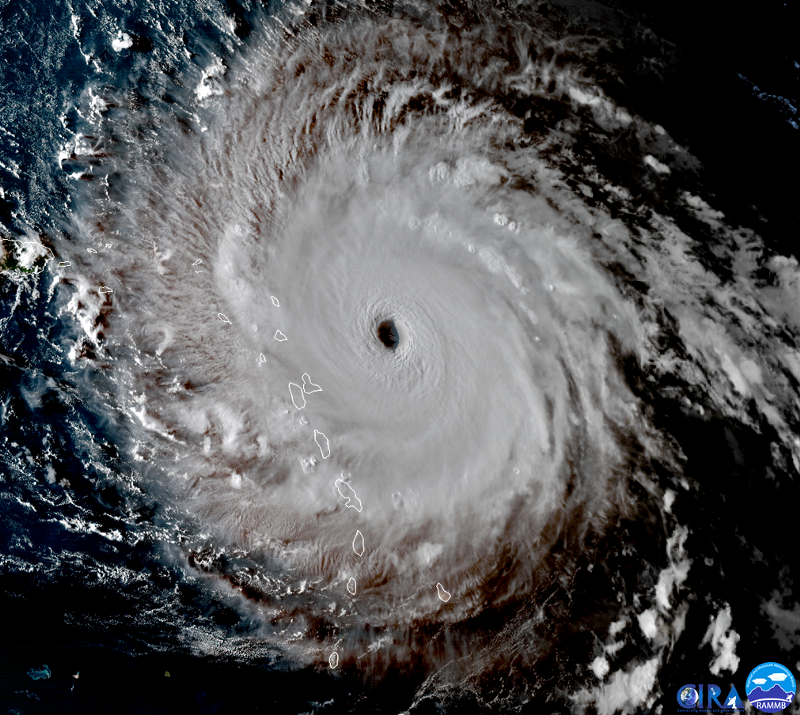 Vivid IR colorization, as the hurricane made landfall on Dominica and moved across the Caribbean toward St. Croix and Puerto Rico. Before the radar site in Puerto Rico was damaged. 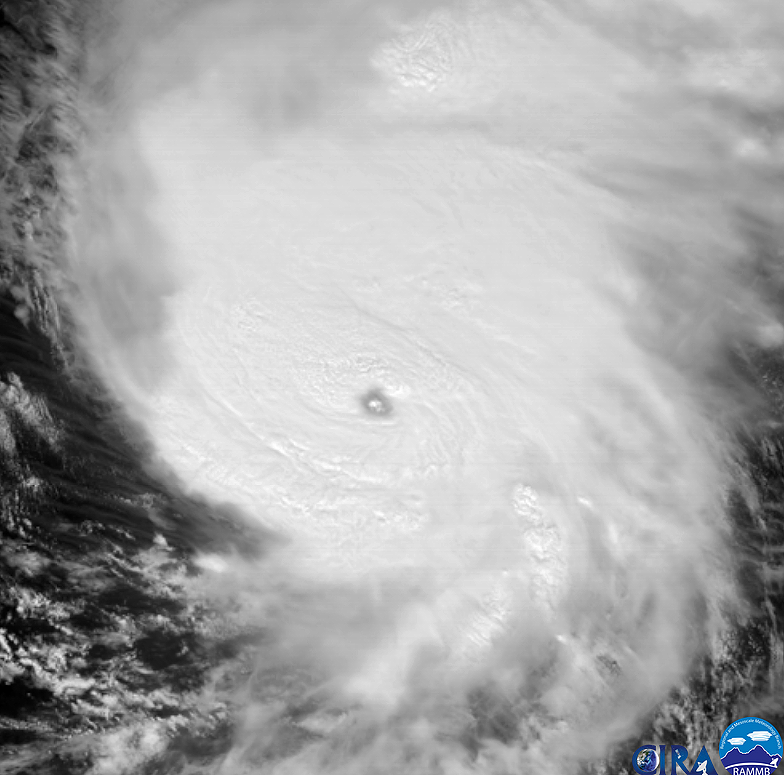 A complex system which contained remnants of Tropical Storm Philippe blasted New England with damaging winds, on the anniversaries of a couple of other notorious tropical/non-tropical hybrid storms. Part of a severe thunderstorm and tornado outbreak which was quite far north for November. 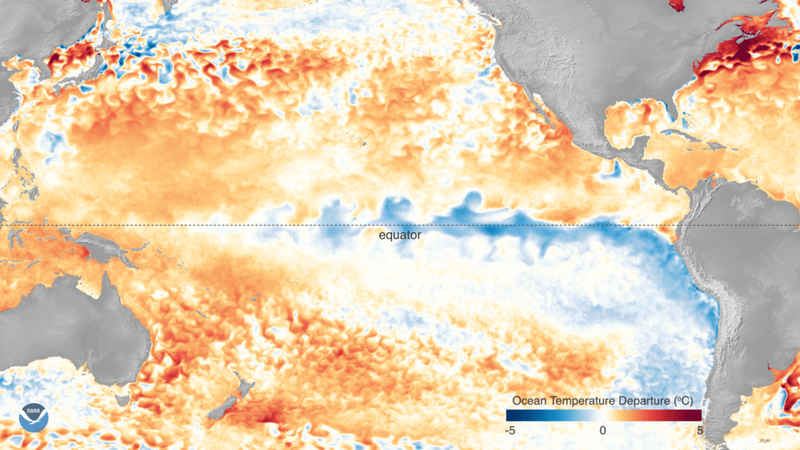 Sea surface temperature (SST) departures from average as La Niña developed. As leery as I am about attribution of ENSO influences, the pattern the past couple months has been influenced at least in part by La Niña. November was characterized by a fast west-to-east flow across North America. The disturbances in this water vapor loop were ironically in the southern branch of the jet stream though (typically active during El Niño). At the end of it, note the contrails over northwest Arkansas. Now that’s a vort max! Similar locations, similarly subtle synoptic situations and difficulty in precisely prognosticating well in advance. 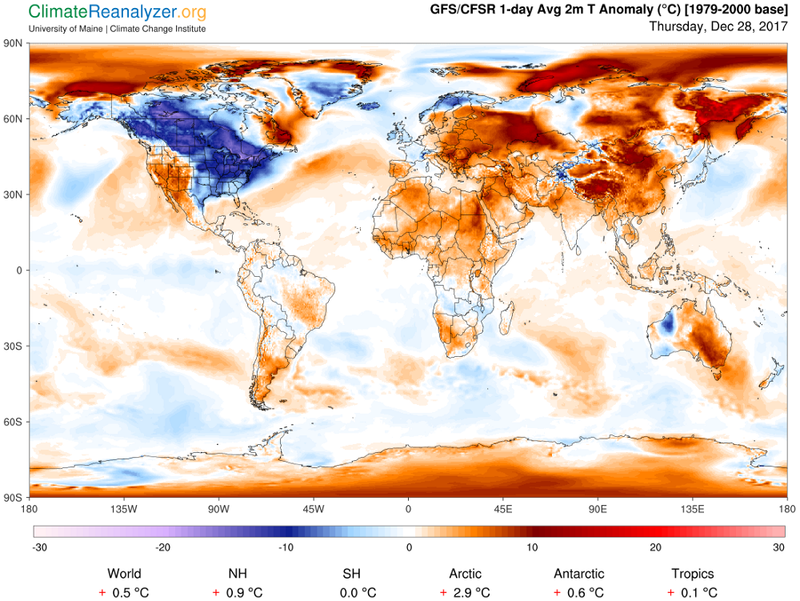 As the year ends, frigid air has come down from the Arctic. As it passed over water, this persistent robust lake-effect band brought record snow to Erie, Pennsylvania. Here a sharp difference on infrared satellite imagery showed up between not-as-cold low cloud tops to the west and cold ground to the east, eroding with the sun’s warmth and as cirrus arrives. 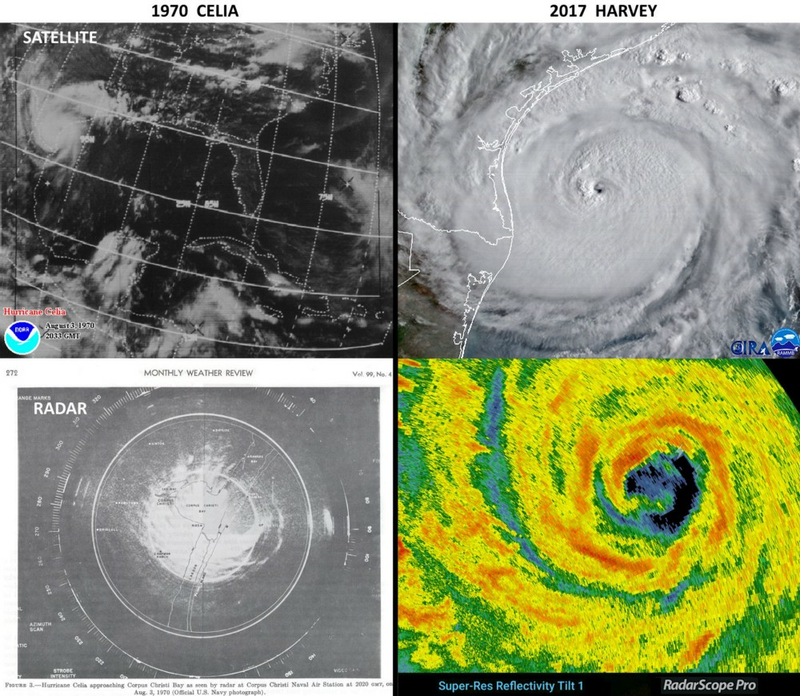 Very Interesting how similar storms appear over time . Complete geek out! Love them! Fascinating pictures!!! Mind blowing colors! Thank you!!! That really was a geek-out! Thanks. wOwZERS is right just imagine the other end of them. Geeked out alright! Wow! And thanks!